California native Andrea Johnson has an impressive cooking repertoire. Her Instagram account is stacked with evidence of her kitchen creations. Andrea's weekends are full of flavorful festivities, and last year she wrote the food column of Walla Walla University’s Collegian. Despite all of this, she has not always been an effortless culinary artist. Andrea grew up on a ten-acre farm in California with six acres of almonds and the rest a patchwork of fruit trees and vegetables. Apples, pears, pomegranates, peaches, peppers, nectarines, tomatoes, eggplants, corn, and strawberries rotate through the remaining acreage. Her father, a physician, found solace in the manual labor farming offered and chose to continue the farming tradition his brothers and father had started before him. Everybody in the Johnson family cooks, and with two experienced older brothers, there was hardly a need for Andrea to join them around the cutting board. Her lack of experience in the kitchen often left Andrea out of the mix. When a position opened in the WWU Collegian for a food editor last year, Andrea jumped at the opportunity. She knew the job would force her to devote time to improving her cooking skills. What she didn’t know was how much she would truly fall in love with the practice. Fast-forward a year, and Andrea’s abilities are unrecognizable from where they were before. She follows food blogggers, researches recipes, and recreates items that she orders at restaurants. Now, as winter quarter winds down at WWU, Andrea is looking forward to heading south to join her family in the kitchen as they prepare Christmas dinner. Like many families, the Johnsons have their own family Christmas traditions. Each member of the family picks a dish to prepare for dinner to help feed their large Mexican and Norwegian extended families. Andrea’s dad will often make a sweet potato casserole, her mother will cook Spanish rice, and Andrea will make enchiladas. Her older brothers will pick out their own recipes to contribute–usually desserts. After dinner, the Johnson’s will go into their backyard and set up a shooting range made of old bales of hay and rotten produce. When target practice is complete, they’ll head back inside for a white elephant gift exchange. On Christmas morning, their stockings will be overflowing with mandarins from their orchard. 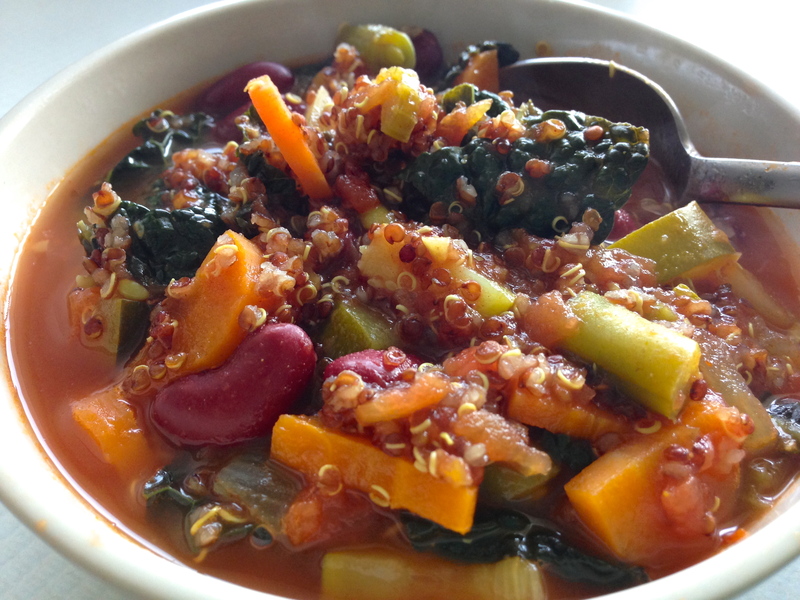 Atop the list of recipe's Andrea has fallen in love with over the past year is her Quinoa Minestrone Soup. Warm, delicious, and full of vegetables, this holiday entrée is great to eat during cold winter nights. From Andrea’s kitchen to yours: enjoy the holidays! In a large pot, place olive oil over medium heat and cook diced onions, carrots, and celery until softened (about 5 minutes). Add minced garlic and cayenne, and cook for a minute more. Add chopped zucchini and green beans. Stir in salt, pepper, turmeric, and paprika, and cook 3 minutes. Add tomatoes and water, raise heat to high and bring to a boil. Once boiling, lower heat, and gently simmer about 15 minutes. Add quinoa and cover for 15 minutes. Add beans and kale (add water if needed), and cook until kale is tender. Taste and add spices if necessary. Sprinkle with parmesan if desired. Rachel Logan is a writing intern for Spectrum Magazine.